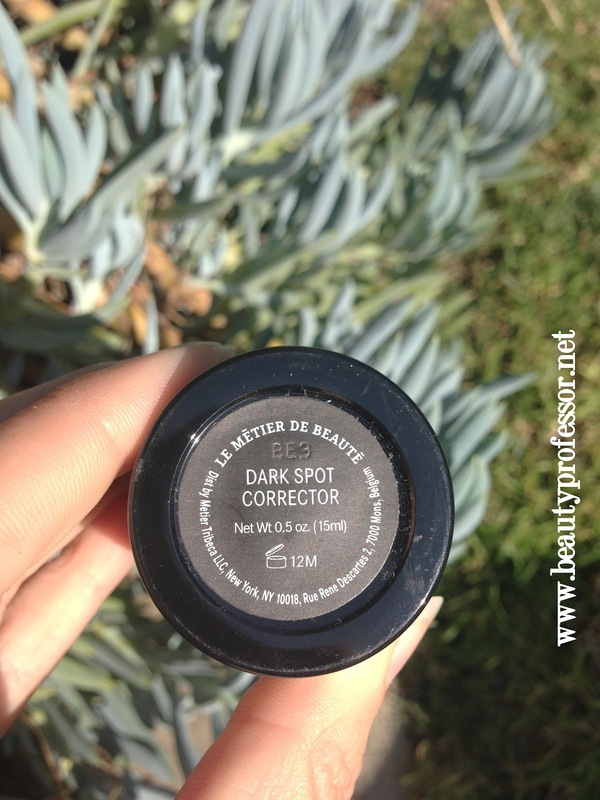 Beauty Professor: Le Metier de Beaute Dark Spot Corrector Preview! Above: Behold! The Le Metier de Beaute Peau Vierge Dark Spot Corrector is finally here! 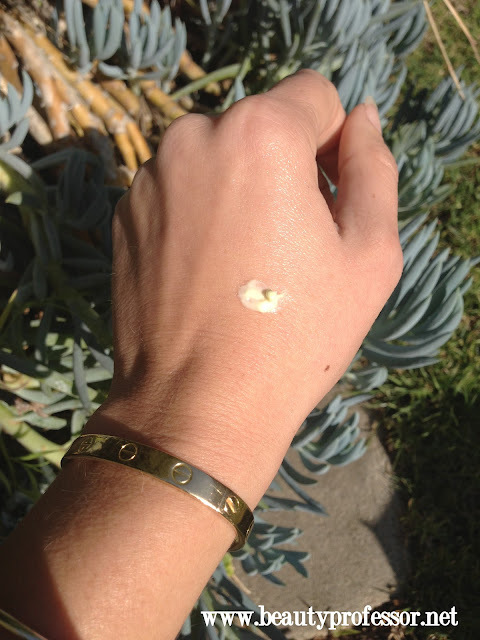 Ever since the Neiman Marcus Beauty Event last month when Scott Reyes mentioned its impending arrival, I have been eagerly anticipating the release of the Le Metier de Beaute Peau Vierge Dark Spot Corrector. Yes, I admit, I spent quite a few beach days in my past outside of the protective umbrage of SPF. In turn, freckles and hyperpigmentation are the reminders of my cavalier youth...lovely. The LMdB Peau Vierge Dark Spot Corrector contains 1% Retinol and 1% Hexylresorcinol, which work in tandem to perfect the skin! Retinol decreases acne scars and photo-aging from the sun, diminishes the appearance of discoloration and reveals lighter pigmentation with each treatment. Hexylresorcinol is said to be four times more effective than Hydroquinone (which has potential carcinogenic properties that...how do I say this gently...I find troubling! ), protects skin's collagen by reducing glycation and effectively treates hyper-pigmented skin. These two ingredients are coupled with Syntoc Actif (also found in the brilliant LMdB Mask and Peel Set), which delivers the potent pair into the skin more quickly and effectively, ultimately yielding deeper penetration and better performance without irritation and harsh side effects. 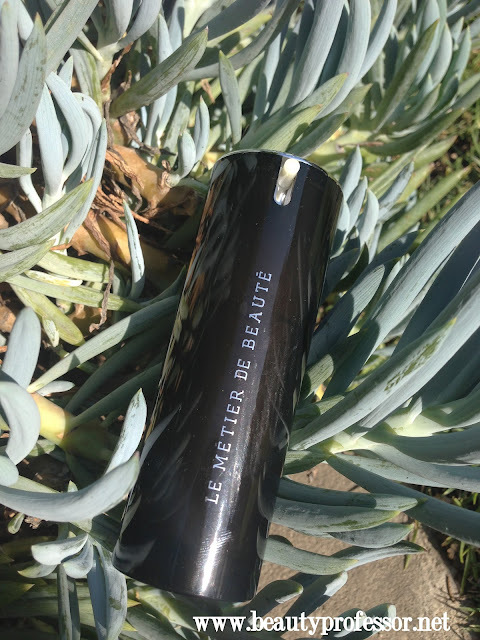 This promising product retails for $125 and is available at Le Metier de Beaute counters (at Neiman Marcus and Nordstorm) as I write this post!! Above: I appreciate the airtight pump container...safe for travel and very hygienic. 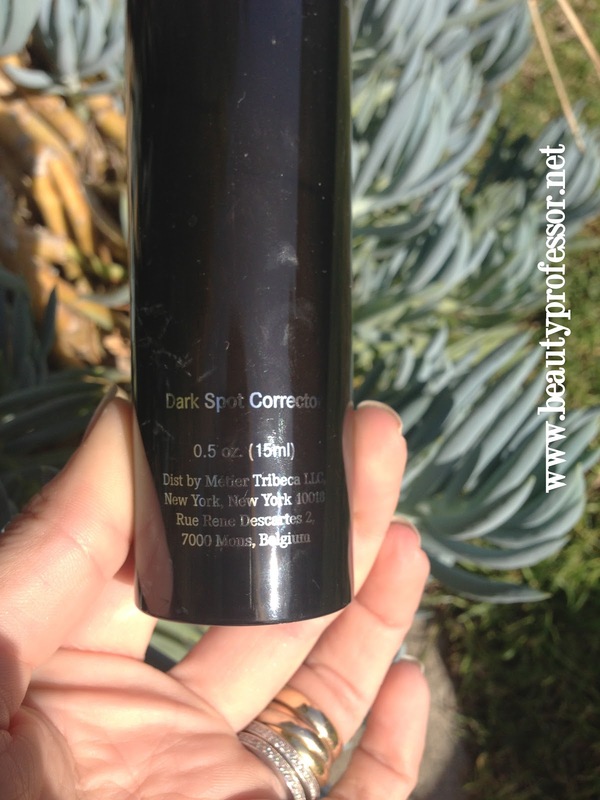 Above: The Dark Spot Corrector has .5 oz. of product....one pump is sufficient for the entire face. Above: A pump of the LMdB Dark Spot Corrector. Bottom Line: I am so excited about the prospects of this product...as someone prone to freckling and hyperpigmentation, the thought of fading away my past indiscretions of sun damage is thrilling! I began my 28 day regimen on 3/08/13 and will report back in early April with the results. Will you be trying this revolutionary new product? Yes, Erin...this is a bit of an investment, but definitely on par with the cost of other products that make similar claims! I will be following up with my results in April!! Will keep you posted, indeed!! FYI for your readers. On the Le Metier website, this is paired with a concealer for the same price under the Vault section. Love your blog! You are the consummate professional! I use Retin A and wonder if this would work well in conjunction with it. Keep us posted ok? I just might take a shot with it! Lovely to hear from you...I am truly flattered by your kind compliment! In response to your question, because there is already 1% Retinol in this product, I would probably not use them together unless your skin is completely accustomed to the effects of the Retin A (e.g., from months of use). I have Retin A Micro (which I only use on occasion, rather than as a regular treatment) and have been avoiding it while using the LMdB. I am finding that my skin started reacting to two applications a day (AM and PM) of the LMdB in the same way it does when I use Retin A Micro for a few days in a row (e.g., a bit dry, slightly red, a little hot...all good things in the long run since they are signs of increased cell turnover!) so I am only applying it at night and, after a week of use, am really excited by how smooth my skin feels. It is likely too soon to confirm that my skin tone is getting more even, but I think I am definitely headed in that direction! I will certainly update on the progress soon...love a wonderful rest of the weekend! My pleasure, Carolann!! I am so glad you and your sis enjoy my blog and videos...I love getting to do what I do!! Just discovered your blog, love it! I am thinking of purchasing this product and was wondering how are you using it, weather it's all over or just on specific areas on the face and with it being 1% retinol are you also moisturing afterwards even though it says it won't cause irritation? So glad you found your way to my blog! With regards to this product, I am apply it by itself, all over my face, only at night. As long as it is the only retinol product I apply, I am not experiencing any irritation or dryness so I haven't need an additional moisturizer! ok Professor i cannot wait for the results in early April too! will you post a before and after photo?? Yes...me too! ; ) I will try to prep the before picture now so that any significant difference will be easy to perceive. Is it 28 days yet? I can't wait to get your opinion on this!! Thanks so much for checking back...yes, it has been 28 days and my review is in the works! !